I cut several basic shapes such as rectangle, square and circle. We also shredded some crepe paper. pretty neat for a dump truck! My almost three year daycare child and I made the your garbage truck craft. Since Oregon is having some sunny days in the mid to high 90’s, we added a happy sun with orange eyes, smile and alternating orange and yellow sun rays. Our Pre-K and younger daycare children get excited when the garbage trucks arrives every Wednesday. The daycare children smile and wave then the garbage man smiles and waves back. The smiles on the children’s faces is priceless. This was our first garbage truck craft. I’m so happy to find a craft that’s easy to do with younger daycare children. 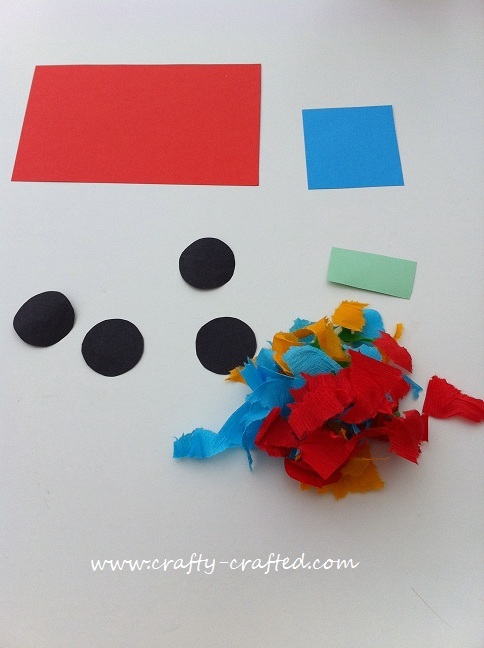 Thank you so much for sharing your toddler friendly, easy and cute garbage truck craft.